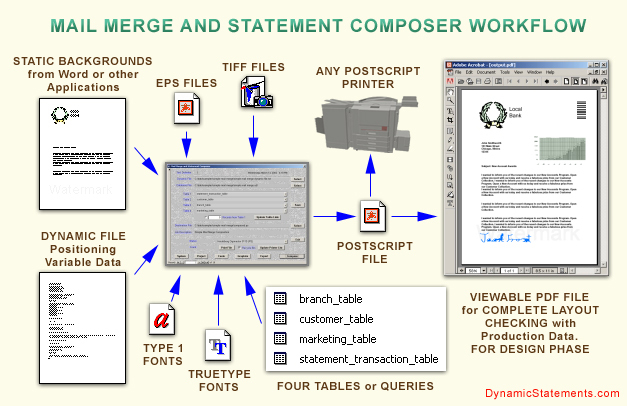 The Mail Merge and Statement Composer is the foremost reporting software tool for producing virtually any document for the production environment including: dynamic and static statements, booklets, invoices, catalogues, mail merges, forms, cheque imaging and other variable data driven documents. Full automation capability added ! This development environment integrates with leading business processes and tools for reduced implementation time. Fast and Efficient: Our Ultra High Speed Page Composition Engine, unlike printer drivers that have numerous speed, capacity and formatting limitations. Accurate: Text, Cheques, Graphics, Objects, Barcodes and OMR marks can be variably sized and positioned anywhere on the page. 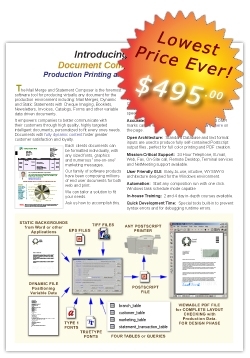 Open Architecture: Standard Database and text format inputs are used to produce fully self-contained Postscript output files, perfect for full color printing. Mission-Critical Support: Telephone, E-mail, Web, Fax, On-Site call, Remote Desktop, Terminal services and NetMeeting support available. User Friendly GUI: Easy-to-use, intuitive, WYSIWYG architecture designed for the Windows environment. Automation: Start any composition run with one click. In-house Training: 2 and 4 day in-depth courses available. Quick Development Time: Special tools built-in to prevent syntax errors and for debugging runtime errors. Add-ins: Multi-image processor and Ultra high-speed image fetcher for processing millions of images, including cheque images from Credit Union Central. Word Macro to automatically convert Word letters into Dynamic Files. Input field data from 4 different tables or queries via UDL (universal data link) interface. XML, ADO, ODBC, OLE DB, SQL, MDB, text delimited and other data connections available. 1000 user defined paragraph variables and 1000 user defined numeric variables. 89 Dynamic commands with up to 5 parameters and 52 user accessible system variables. System, Project, Fonts and Graphics Forms for data input. Full 32 bit CMYK color, 24 bit RGB color, highlight color, grayscale, black and white capability. Unlimited scaleable TrueType (.ttf) and Type 1 fonts (.pfb). 6 user definable paper stocks for different sizes, weights, colors and types per project. Huge ADO record size and record count capability. Export feature to append field names, font names and EPS names to Dynamic file for "copy and paste" coding. Multi-pass mode for sorting and grouping statements / accounts in output Postscript file. Multi-pass mode for "page of pages" or multiple subset counts. One click refreshable tables, queries and printer lists. Insertable variable data driven Point, Bar and Pie Charts. Bar Code and OMR mark placement anywhere on the page. Unlimited grouping of data fields i.e. Unlimited multiple record fields per set. Transparent "ink" mode available for page re-composition e.g. computing vertical centering. Three composition events per run: "end_line_event","end_old_page_event" and "start_new_page_event". Postscript "pass-through" mode allowing user to pass Postscript commands through the application to the printer. Dynamic backgrounds that size with the text and images including color and borders. Automatic transparent pixel conversion for Tiff graphics. e.g. 1 Bit signatures will have transparent background for possible watermarks to show through. 8 Bit photos will not. Unlimited column lengths and text wrapping. Fully self-contained PostScript output for portability, performance and redundancy. PCL, ASCII and Metacode outputs are also available via converter. Widow / Orphan Capability i.e. Wrap a product header to a new page if there is not enough room on the current page, for both it and at least one transaction. Unbreakable column data capability, to avoid breaking data into two sections across two pages. Variable size marketing messages can be dynamically created and placed anywhere on the page. Adjustable Dynamic command delimiter for each project. Product subtotals, page subtotals and variable accumulator capability. 3-D Vertical and spiral text placement. Adjustable banner page with total page count and project comments reporting. User defineable projects with import and export	capability. Variable page orientation, rotation, scale and positioning capability. Easy to use system log file for debugging user code. User definable and importable log file. Extended character set capability - WYSIWYG glyphs. Unlimited headers, sub-headers, footers and sub-footers including sizing and widow control. Built-in functionality to copy or move Postscript files directly into printer queues with recycle bin option. Unlimited watermark, overlay and overlapping capability. Supports many document structure commands (DSC). Scalability and modular for easy expandability. Add Pdfmarks for better user control. Utilization of VM (virtual memory) on the printer RIP to maximize performance during high speed merging. Utilization of all blank white space, no matter how	small. Status display and page count built-in. Add-in: Ultra High Speed Image Fetcher and Multi-image processor for auto-scaled cheque imaging and placement. Output compatible with our E-Document Composer which converts Postscript files into full color PDF E-Documents for archiving and E-delivery. Extensive Product training and support. On-going Maintenance, Upgrades and Updates Available.